Even though every situation is different, most of the time you will find the trenchless method to be a better option than digging a trench. The cost of a traditional sewer pipe repair depends on how accessible the old pipe is, ground and soilconditions, concrete and other obstructions, and more, and therefore can be very costly. Then comes the cost of repairing your yard, repaving your driveway, etc. Pipe Bursting: The pipe busting method of trenchless technology sends a cone shaped bursting head through the old pipe breaking it up along the way and pulling in a new pipe behind it. This method only requires two small access pits at the end of the old sewer pipe which means minimal excavation. Traditional sewer repair will always come with various types of damage, repairing driveways, floors, landscaping and reseeding your lawn with new grass. 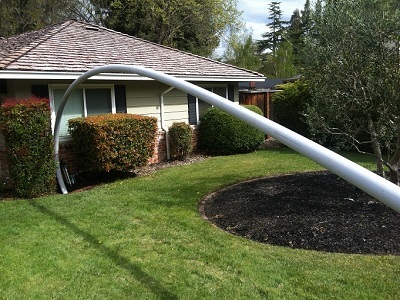 Those problems and expenses are not an issue with the trenchless method. Advanced Trenchless offers FREE estimates. Call us to schedule an appointment at (925) 932-4023, (510) 352-2220 or (707) 644-7700. Remember to like us on Facebook too: Click Here.